The following is a guest post by Canadian author and comedian Bryan Maine. Bryan asked me if he could write a piece about his upcoming Kickstarter book, in which he taps into some intense experiences he had in Japan some years ago. Hats off to a writer and entrepreneur doing his best to make it happen. Good luck to you, Bryan! Six years ago I was a Canadian university student in Tokyo for the summer with my then girlfriend and needed work. My friend's father set up a job at a neighbourhood preschool for me within days. I was weary, expecting to be the warden I rebelled against so strongly only years prior when I was an exchange student in a Japanese high school. Preschool was completely different. The children were bubbly and full of life. I noticed if a child was crying or hurt that the teachers had no fear when lifting the kid up and kissing the scratch on their arm to make it better. It wasn't "inappropriate" the way it seems our western culture has made it out to be, it was providing general love and compassion to a child. The oddest experience was a particularly hot day that I was asked to assist with a large steal drum sitting a top cinder blocks in the centre of the play yard. A hose was draped over the side pumping water as another teacher fanned a tiny fire beneath the barrel. I asked what the set up was for and they explained that since it had been an extra hot week we were making a pool for the kids to take a dunk in. On that note another teacher ushered out a parade of 30 small naked humans waiting for their turn, giggling. I was shocked. The entire 5 year old class was standing naked in the school yard and right at that moment an old woman road her bicycle past the gate and waved with a smile, completely unaffected by the sight. With each dunk, the child would give a brief shiver before smiling back at their classmates to the cheers of excitement. After the moment in the spotlight we hoisted the kid out and wrapped a towel around them on their way inside. "Why are the kids all naked" I asked, lowering a fresh body into the makeshift hot tub. "Because they don't have their swimsuits today" the other teacher responded matter of factly. It wasn't odd that tiny kids were naked in sight of the public, it was odd to wonder why. As my time in Tokyo past the girl I was there to be with became more and more distant and as such I became very depressed. She resented me for all the negativity of her family towards her for dating someone not Japanese. Each day I arrived at the school in the morning to the joyful smiles of the kids with a level of excitement that expressed hours of anticipation. One child in particular would run up and tug at my wrist, when I looked down he would laugh with pride that he had gotten my attention. With a light peck on the back of my hand he turned his face up to grin at me before letting go and returning to the other children. It was the type of appreciation and excitement I once had in my relationship. The children of the school were the only thing that kept me sane. 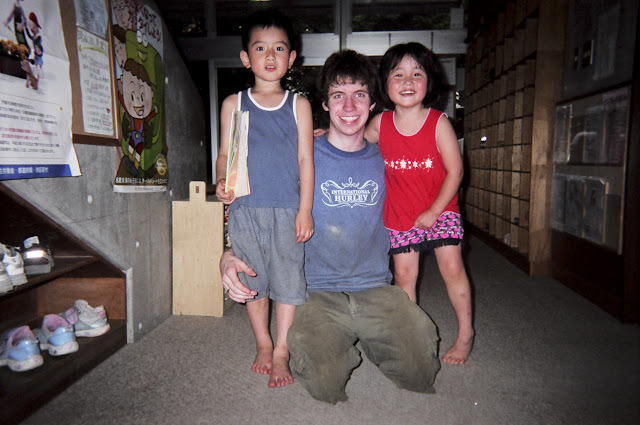 They didn't judge me for being a foreigner but were constantly curious and happy. Their joy was a reminder to me to try and hold onto mine. The experiences listed above are all part of my new book Grasping at Self Worth. The book is available by searching the title at www.kickstarter.com or by clicking the link above. It expresses my experience of travelling to Tokyo with the girl I loved only to have her mother and older sister torture her because I wasn't Japanese and the sacrifice of my own sense of worth in an attempt to please them.